South African Court Denies Oscar Pistorius' Bid To Appeal Murder Conviction : The Two-Way Signaling a possible end to a years-long legal saga, South Africa's highest court denied the former track star's request, clearing the way for sentencing. The ruling by South Africa's Constitutional Court clears the way for a judge to sentence the double-amputee runner, pictured in 2014, for murder at a hearing set for April 18. 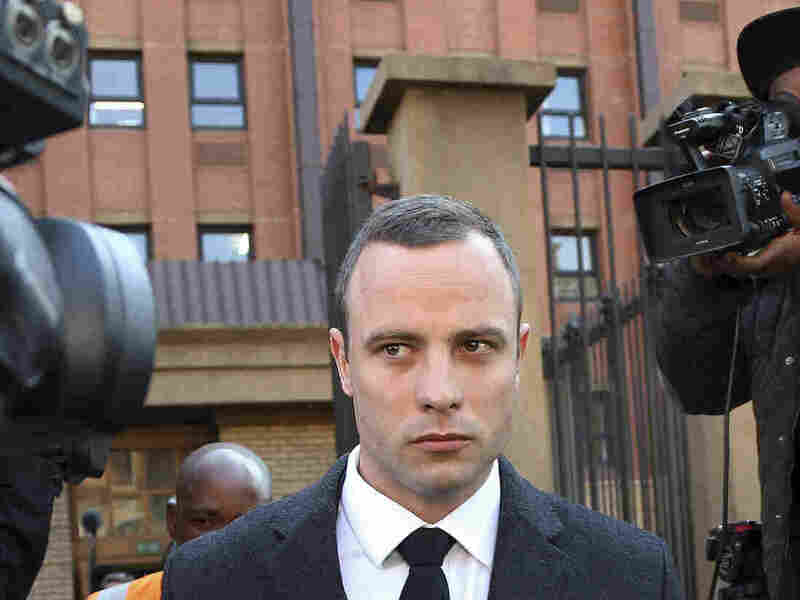 Signaling a possible end to a years-long legal saga related to Oscar Pistorius' killing of his girlfriend in 2013, South Africa's highest court denied the Paralympic champion's request to appeal his murder conviction. "We can confirm that Oscar Pistorius' leave to appeal has been denied," National Prosecuting Authority spokesman Luvuyo Mfaku said, according to Reuters. The case will now proceed to sentencing, with a hearing scheduled for April 18. Pistorius shot his girlfriend, Reeva Steenkamp, through a bathroom door on Valentine's Day after they had argued. The double-amputee sprinter maintained that he thought he was shooting an intruder. A judge found him guilty of culpable homicide, which is equivalent to manslaughter, and Pistorius served one year of a five-year sentence in prison before being released to house arrest. "While granting the appeal, Judge Thokozile Masipa dismissed prosecutors' bid to appeal Pistorius' five-year prison sentence. The prosecutor in the case had argued that the sentence was 'shockingly inappropriate.' "
Pistorius was found guilty of murder. His lawyers moved to appeal the conviction. The Guardian reports they argued that the court "ignored his vulnerability as a person with a disability," believing that it "wrongly rejected a lower court's judgment that Pistorius acted out of fear when he opened fire at what he thought, by his account, was an intruder in his home." Now that the country's highest court has denied the right to appeal, the sentencing for his murder charge will take place. The minimum sentence for murder in South Africa is 15 years, though a judge can reduce that sentence for what the law describes as exceptional circumstances, The Associated Press reports. After winning multiple Paralympic medals, Pistorius became the first amputee athlete to run at the Olympics. He was called the "Blade Runner" for his carbon-fiber running blades.